MTC at City Center Stage I, 131 W. 55th St 212/ 581-1212. Running Time: 2 hours and 30 minutes, includes one intermission. Tuesday through Saturday at 8 PM, with matinees on Saturdays and Sundays at 2:30 PM. Sunday eveningperformances are at 7 PM. Tickets are $60. Student tickets are $20 and are on sale for all performances based on availability on the day of the performance, up to one hour before showtime (limit 4 per student with valid identification). Flora Humble: (in reply to a question about what her son lectures in) It's a bit like Astrology, or at least not a million miles away . . .
Felix Humble:It's theoretical astrophysics actually. Humble Boy is a new play from Charlotte Jones whose In Flame (Our Review) had a West End showing after playing at The Bush. The play, which comes directly into the National Theatre's well liked smallest space, the Cottesloe, and stars Dame Diana Rigg and Simon Russell Beale, has almost too many themes. Yet it is the kind of play I could watch again soon and appreciate at a different level. The story of a mother and son who live in the fictional Cotswold Village of Moreton in the Mold has its most obvious parallel in Shakespeare's Hamlet. Other themes covered include dysfunctional families, bee keeping, theoretical physics and the gap between reality and our perception of it. If this sounds like heavy material, the opposite is in fact true as there is much to laugh about and enjoy in the witty dialogue and the splendid performances from the ensemble cast. Felix Humble (Simon Russell Beale) is a Cambridge University lecturer. In his late thirties, unmarried and largely unsuccessful, he has returned to his parent's home for the funeral of his father. His academic quest is to work on superstring theory which is the theory of everything and would embrace both Einstein's Theory of Relativity and quantum physics. Felix's father was a biology teacher and a keen entomologist, botanist and beekeeper. Felix has balked at delivering the eulogy at the funeral service and left the church. His elegant and beautiful mother, Flora Humble (Diana Rigg), is entertaining the rather vulgar coach fleet owner, George Pye (Denis Quilley), who has amorous intentions towards her. Flora has just had a cosmetic operation on her nose which results in her losing her sense of smell. Nurse and single mother Rosie Pye (Cathryn Bradshaw), George's daughter, once had a love affair with Felix but was deserted by him. George hates Felix. Felix hates George. The spinster, Mercy Lott (Marcia Warren) is Flora's friend but her role is almost that of a maid. 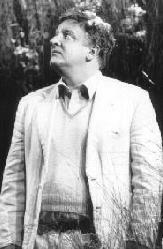 Jim the Gardener (William Gaunt) interacts with Felix alone, until the final scene. Jones' play is rich in metaphor. The references to Hamlet are underlined by the casting which has some of the actors who were in the National's own production of Hamlet reprising their parallel roles. There is also the symbolic likeness of these characters to the society of bees. Flora is obviously the Queen Bee. When she first appears in a navy coat and matching dress with huge sunglasses she does indeed look like a large eyed insect.. Other characters fall into drones or worker bee roles. Simon Russell Beale gives us moments of great humour as his sardonic delivery finds its mark but he is also a sad figure, out of sympathy with his mother and having missed out on his own child. His ability as an actor to engage the audience is quite remarkable. There is no way that he is physically beautiful, except perhaps to a mother, but he is so appealing because he makes us smile. Diana Rigg as Flora is the opposite as a selfish, vain fashion plate who has had her husband's swarm of bees destroyed with indecent and insensitive haste. When it emerges that she and George have been lovers for years, we sympathise with Felix. Denis Quilley's wheeler-dealer, sexually pushy suitor inspires all the revulsion Hamlet must have felt when he looked at Claudius. Marcia Warren almost steals the show as the ditsy, well-intentioned spinster who makes herself useful to the Humble-Pyes with darkly humorous consequences. Tim Hatley's beautiful set is the garden of the Humble abode but with a backdrop of overgrown meadow, luscious long grass, poppies and wild flowers dominated by a large, conical beehive. Director John Caird uses the Rimsky Korsakov's Flight of the Bumble Bee music to make sure we make the insect connection -- just in case we missed the bee on the posters or failed to notice the cast pictured in the programme pinned in insect display cases. It is almost as if Charlotte Jones is playing with her audience as she hints at her themes and her surprise references are so stimulating, I think everyone will get a scent they can enjoy from this pot pouri of a play. Charlotte Jones' new play Humble Boy has transferred from the National Theatre to the West End for a short run and is, if in any way changed, actually enhanced by the move. The play is visually well suited to a traditional West End proscenium theatre, in fact the enclosed arch framing Tom Hatley's long grassed meadow is a beautiful staging of this enchanting English country garden. The other major change is the replacement of Dame Diana Rigg by Felicity Kendal as the mother, Flora Humble. The nuances are more subtle with Miss Kendal's performance, she is more believable as a parent of the maladroit Felix and seems less the villainess than the haughty Rigg. The good news is that the play stands up well to a re-viewing; it is only eight months since I saw it, but Charlotte Jones' many themes give the returning theatregoer the opportunity to appreciate differing complexities. In a move that could not have been predicted but is any publicists' dream, the first night was the day after the London Critics' Circle awarded Charlotte Jones' Humble Boy their "Best New Play" award.